countertops are never overlooked, always in use and the first thing most people notice when they make their way into your kitchen. natural stone is considered the gold standard of kitchen countertops; it conveys class and culture. 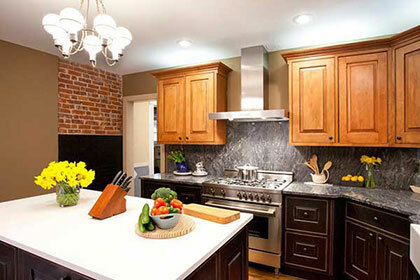 natural stone countertops also give your kitchen character that can't be duplicated. But like everything nice in life, you do need to know a thing or two about natural stone countertops if you want them looking their best all the time. Granite is strong and sturdy. Marble is elegant. Soapstone is the venerable natural stone that adds gravitas and a touch of class. Choose the stone that best matches your personality and that of your home. Stone countertops with rounded edges don't chip as easily as those that have squared edges. When you are choosing your design, consider having your natural stone countertop fabricator round the edges. Even though natural stone countertops are extremely durable, you still need to take good care of them. Make sure to immediately wipe up any spills, especially the ones that include acidic liquids like wine and fruit juice. Doing so will help keep your countertops stain-free forever. One of the most overlooked stone countertop tips is this: Make sure to promptly repair any cracks or chips. If you don't they could quickly spread and require complete countertop replacement. If you do notice a chip or crack, contact your St. Louis stone countertop fabricator immediately. Before you commit to a stone countertop fabricator, do your homework.